The skin is not only the body’s largest organ, it is undoubtedly one of the most resilient and adaptable. It stretches to accommodate growth during puberty and pregnancy; it contracts when we lose a bit of weight. The skin is indeed remarkable – but it doesn’t change without leaving visible signs. Stretch marks tell a tale of your body’s evolution. If that’s a tale you’d rather keep to yourself, CHOLLEY’s proprietary BIOLASTON Anti-Stretch Marks Home Program can help. Stretch marks result when the skin stretches suddenly, as during pregnancy. When under stress from growth, the middle layer of the skin stretches and tears. This leaves a visible mark on the surface. Initially, the marks are red or purple, and often quite vivid. They do fade over time, mellowing into a silver or white tone, but they rarely disappear. How to erase stretch marks? BIOLASTON is specially formulated to reduce the appearance of stretch marks and restore elasticity to the skin. This, in turn, reduces the risk of future stretch marks by keeping your skin supple and resilient. BIOLASTON Natural Peeling for Body. This scrub eliminates dead skin cells, removes excess keratin, oxygenates and hydrates the skin, and feels wonderful. It also activates cellular regeneration and elasticity, key to fighting stretch marks. BIOLASTON Anti-Aging and Moisturizing Emulsion. A light, creamy fluid, this emulsion optimises hydration and builds the skin’s natural defenses. It battles both loss of firmness and the effects of aging. BIOLASTON Anti-Stretch Marks and Nourishing Phyto Oil. 100% natural, this oil refreshes as it strengthens and nourishes the skin. It works to improve your skin’s flexibility and strength. Your body changes and grows; it’s a fact of life. Our skin has a wonderful ability to change with us. 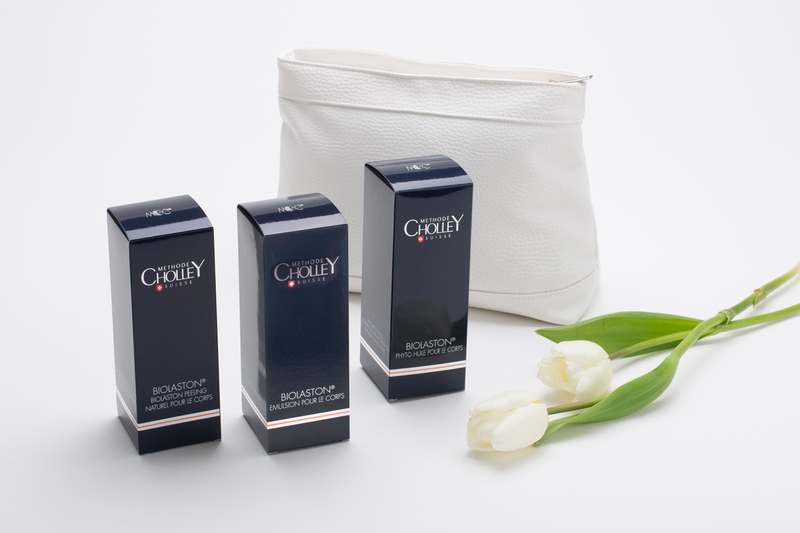 But when you want to keep those changes to yourself and reduce visible signs, CHOLLEY’s revolutionary BIOLASTON Anti-Stretch Marks Home Program will help.